Once the data is telemetered to the ground stations, it is unpacked, formatted and then packed again for the Ground Processing facilities. These ground processing facilites are responsible of the treatment of the satellite data up to L2 (see Section 4. Product Levels). During the on-board processing, the waveforms have been affected by the instrument gains and attenuations and they may have suffered phase variations as well. All these factors have to be accounted on-ground before the Delay-Doppler processing starts. Once the waveforms have been corrected by all the on-board factors, the beam forming starts. 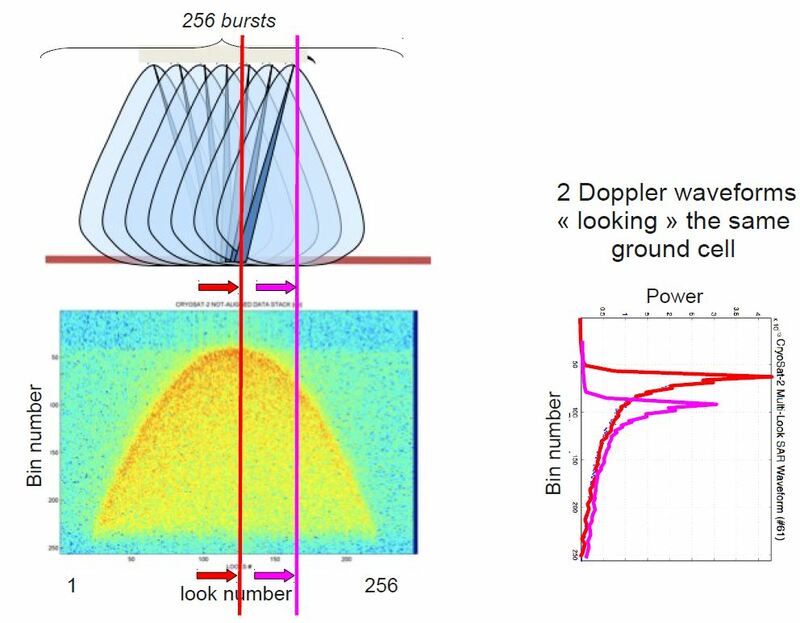 The beam forming consists in dividing the Doppler bandwidth of the pulses of each burst in different Doppler cells, defined by the surface sampling that has been performed previously (see Section 2. Resolution cells). This means that the pulses have been split according to Doppler frequencies. And the remaining waveforms are called beams, each of them being the backscattered contribution of each corresponding resolution cell. 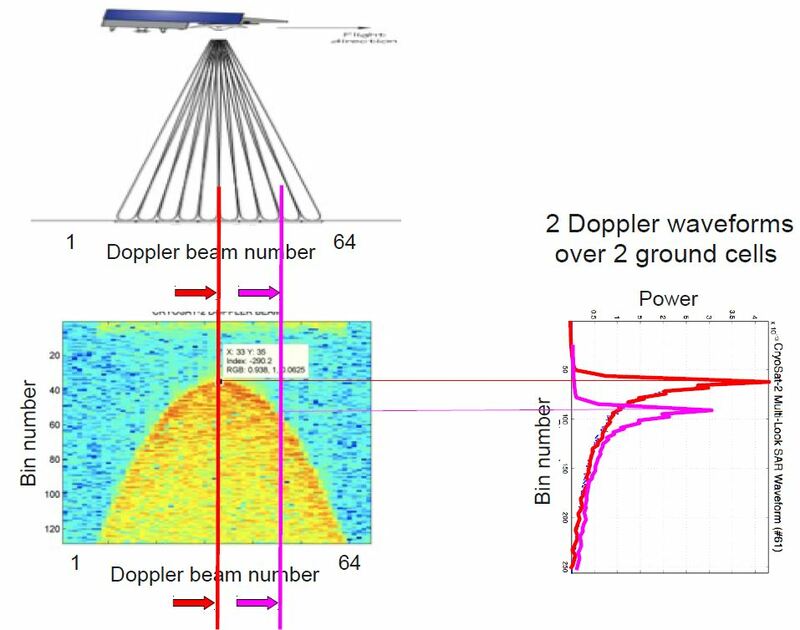 The figure below depicts the beam forming process, with all the Doppler beams obtained from the transmitted burst of pulses. After the Doppler beams have been created, stacks are formed. A stack is the collection of all the beams that have illuminated the same Doppler cell. After the collection, the whole stack is averaged (multi-looking). Note that, before averaging, the stack has been aligned and the beams have been converted to power waveforms. The average should be performed in the along track (beams) dimension in order to get the L1B waveform. If we perform the average on the range dimension we obtain the power distribution along track (top right). 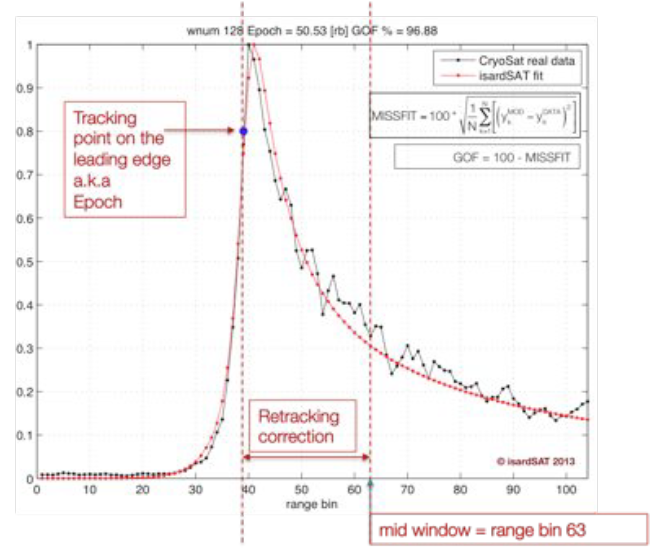 Retracking is the process that allows extracting scientific parameters characterising the observed scene from the input L1B waveforms. Hence, retracking is a key step in the ground processor chain. Retrackers can be analytical or empirical. 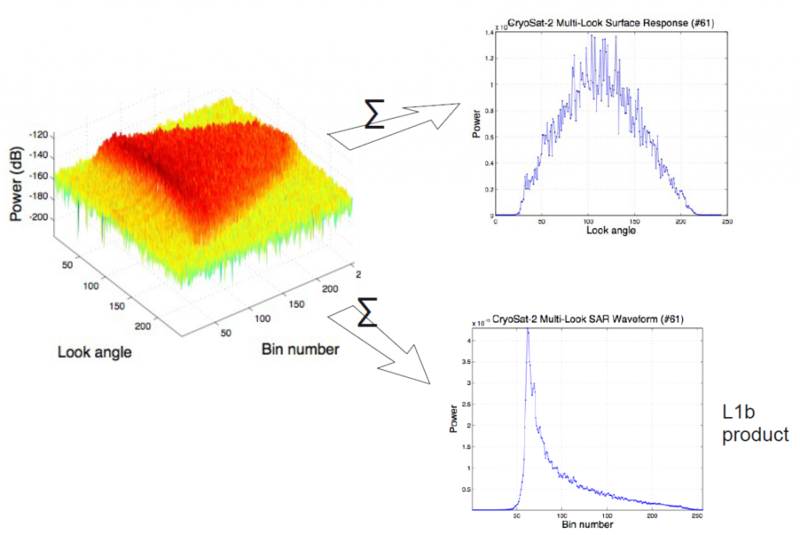 In the analytical ones, a mathematical model emulating the L1b waveform is generated and fitted to the L1B waveform under analysis to extract 3 parameters (epoch, SWH and Pu). In order to do so, the model shall replicate all processing steps that led to the production of the L1B waveform to be retracked. Furthermore, wind velocity can also be extracted from the backscattering coefficient.